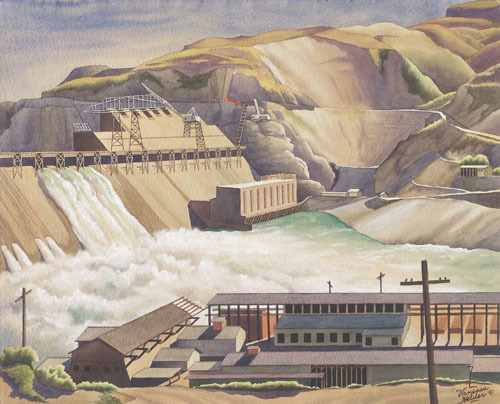 Z. Vanessa Helder, Coulee Dam, Looking West, 1940. Watercolor on paper, 18 x 21 7/8 inches. Northwest Museum of Arts & Culture/Eastern Washington State Historical Society, Spokane, Washington. Z. Vanessa Helder was a one-of-a-kind, nationally recognized master watercolorist from the Northwest, but decades after her 1939 solo exhibition at the Seattle Art Museum and after exhibiting at the Museum of Modern Art, the Whitney Museum of American Art, and the Metropolitan Museum of Art in New York City, her name and artworks have all but been forgotten….until now. Tacoma Art Museum is bringing Helder’s rare talent and striking, expressive works back to the public in Austere Beauty: The Art of Z. Vanessa Helder. The exhibition and accompanying catalogue are the first major survey of this under-recognized artist’s life and artistic career. Co-curator David Martin, a well-known Seattle art historian and owner of Martin-Zambito Fine Art has spent decades researching Helder including a two-year nationwide search to relocate the artist’s important works. Thanks to his tireless efforts, the museum is able to present a broad range of Helder’s iconic images, such as her series about the building of the Grand Coulee Dam, her portraits, and her depictions of eastern Washington landscapes and regional landmarks like Alki Point Lighthouse.